“THE secret of success in battle lies often not so much in the use of one’s own strength but in the exploitation of the other side’s weaknesses.” So says British sci- fi writer Samuel Youd in The Tripods, a trilogy on aliens’ invasion on Earth. The saying holds true for scientists across the globe who are trying to understand strategies plants use to invade foreign lands. 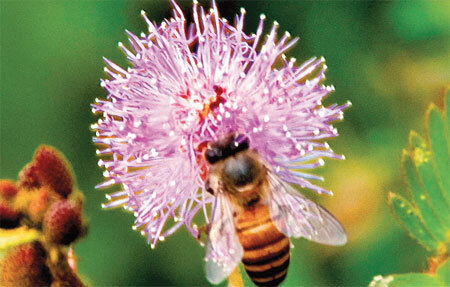 In India, 18 per cent of the flora is alien to the country. Though they have become naturalised, plants like lantana, mimosa, parthenium and prosopis continue to invade the subcontinent, posing a serious threat to its biodiversity and economy. Adding to the understanding of what promotes their invasion, scientists led by Oliver Bossdorf of Institute of Plant Sciences at University of Bern, Switzerland, have found a clue in the changes in environment, such as varying levels of soil nutrients. The scientists chose to experiment on Japanese knotweed (Fallopia japonica), one of the world’s most invasive plants. They planted it along with several native plants of Europe and provided it with nutrients in five different ways: constant low supply, constant high supply, gradually increasing supply, single large nutrient pulse, and multiple pulses of different magnitudes. They found that changes in soil nutrition had no effect on the total biomass of native plants, but knotweed almost always outnumbered them. “If resources were gradually increasing over time rather than supplied at a constant rate, the success of knotweed more than doubled, and even tripled if resources were supplied in a single extreme event. The greatest increase of knotweed occurred where resources were supplied unpredictably through multiple pulses of varying magnitudes,” the scientists wrote in their study published in Nature Communications on March 19. Such occasional oversupply of nutrients is common in real life. Flood is one such occasion. Use of fertilisers in agriculture also leads to sudden overdose of nutrients. This is one of the reasons weeds grow and spread rapidly in and around agricultural fields. Conditions of gradual increase in nutrition is also not uncommon. There has been a global increase of atmospheric nitrogen deposition, which fertilises plants. Proliferation of invasive plants is not linked to only nutrients. “One could find similar results for increased light or water availability,” says Bossdorf. For instance, logging in forest suddenly exposes forest floor to abundant sunlight. Species that quickly take advantage of the “light pulses” are winners, he adds. Interestingly, invaders do not affect biodiversity in their native areas. A study by Inderjit and Rajwant Kaur of the Department of Environmental Science, University of Delhi, and collaborators from the US and Peru shows this. Prosopis juliflora (known as kikar in Hindi) is a notorious invader in Delhi’s Aravali range. It is known to dry up surface soil and its canopy hardly supports any understory species. But in its native land Peru, the plant facilitates the growth of other species. Soil under its canopies has higher concentration of organic matter, nitrogen, phosphorous and potassium, the scientists wrote in Plos One in 2012. Scientists are making efforts to eradicate invasive plant species around the world. But it is not simple. Bossdorf says the short-term solution is mechanical removal of these plants but it is time-consuming and expensive. Killing them with chemicals is dangerous for nature and people. Even biological control of weeds by introducing natural enemies is not reliable as it can create new invaders. For a long-term solution he suggests sustainable land use by reducing fertilisers and working towards reducing anthropogenic climate change. But even with these measures, it may not be possible to eradicate invaders like knotweed. “This is why preventing introduction of invasive species in the first place is important,” Bossdorf adds. “Plants like kikar and eucalyptus were introduced to get quick greenery,” says Gyan Prakash Sharma, assistant professor of environmental sciences at Delhi University, who has studied invasive plants. He suggests long-term studies on the impact of new plants on the natives before introducing them.